In the above statement, we are told not to engage in controversy over questions which do not help us spiritually, such as the question of the 144,000. It goes on to say that those who are the elect of God will in a short time know without question. This statement is often used as a most effective damper to stifle any discussion of or opinion on this question; yet when we go back to the time of Sister White and her contemporaries, we find that they by no means kept silent on the point. In this lesson, we wish to present some of their well-researched conclusions on this question, because we believe that its study will clear up some misconceptions that have become common among Seventh-day Adventists. Today, when we ask Seventh-day Adventists about the 144,000, we receive the most fanciful, far-fetched replies. Seldom do these answers agree with one another. There is great darkness on this point among Adventists. Yet the pioneers of our message were not at all in the dark concerning it, even if we readily concede that they in their time and we today probably do not yet know all about it. The Seventh-day Adventist Bible Commentary mentions several ideas about this special class but leaves any conclusion to the reader’s preference, since the editors of the book do not take a stand themselves. We believe the reason for the ambivalence on both this point and other related truths that were once crystal clear to our spiritual forebears is that agreeing with any one idea would condemn the present state of affairs. Today the denominational membership hovers around the 2 million mark [1972 statistics]. How could the leadership still profess to believe that the total result of the third angel’s message will be only 144,000? Other explanations have to be found, and other interpretations are introduced to becloud the issue. None of these ideas can satisfy the searching mind. 1844 was a milestone in our history for several reasons. We understand that this date denotes the end of the longest prophetic time period in the Bible. At the conclusion of this period, there would be no more prophetic time. The prophecy of Daniel 8:14, as explained by William Miller and his associates, still stands as an unassailable fortress, supported by proofs from the Scriptures and history. There is no question as to the accuracy of its culmination in 1844. William Miller was mistaken as to the meaning of the event that was to take place at that time, for he shared the common view that the sanctuary was this earth and hence concluded that the prophecy could only refer to the second coming of Christ. This he boldly preached, and his message was widely accepted. Then came the terrible disappointment, an experience which the believers later discovered was prophesied in Revelation 10. They banked upon the last verse of this chapter to reestablish their faith in the prophecy. In 1844, something occurred in heaven, and something happened on the earth. This was the ushering in of the last phase of the plan of salvation, the day of atonement. Type and antitype met in a marvelous way, the study of the sanctuary became of the utmost importance, and great truths were revealed to the early Advent believers. These truths have been lost or are completely unknown to many new Adventists. The event in heaven was Christ’s beginning His high priestly service by entering into the Most Holy Place of the heavenly sanctuary to atone for all the sins that were sent there previously in the prayers of the saints. The event on earth was the birth of the great Second Advent Movement, which was to carry the last message of the everlasting gospel to every nation, kindred, tongue, and people. The outstanding feature of this message was the proclamation of the seventh-day Sabbath. This day was declared to be the seal of the living God. Only in the fourth commandment is found the authority of the Lawgiver, stating His name, His title, and His territory (God, the Lawgiver’s name; Creator, His title; and heaven and earth, His jurisdiction). “The Lord has been pleased to give His people the third angel’s message as a testing message to bear to the world. John beholds a people distinct and separate from the world, who refuse to worship the beast or his image, who bear God’s sign, keeping holy His Sabbath–the seventh day to be kept holy as a memorial of the living God, the Creator of heaven and earth. Of them the apostle writes, `Here are they that keep the commandments of God, and the faith of Jesus. '” -Letter 98, 1900 (Evangelism, p. 233). As is apparent in the above statement of the Spirit of prophecy, there is a direct correlation between the sealing message and the third angel. We shall pursue this a little further. The two concepts of the third angel and the sealing are here combined in one sentence. For further mention of the seal of God and the sealing time, please see Early Writings, pp. 38, 43, 44, 48, 50, 58, 67, 279, and The Great Controversy, p. 640. 1. The sealing time is synonymous with the proclamation of the third angel’s message. 3. There are two phases to the sealing: (a) Sealing by the Holy Spirit (Ephesians 1:13; 2 Corinthians 1:22; Ephesians 4:30); (b) The pressing on of the seal in the time of the Sunday law (see Testimonies for the Church, vol. 5, pp. 216, 475, 476). In the Scriptures, we turn to Revelation 7, where the 144,000 are mentioned as the ones who are being sealed with the seal of God. In Revelation 14, the 144,000 are presented as the ones who have the Father’s name written in their foreheads (an obvious reference to the seal of God). They are called the saints who keep the commandments of God and have the faith of Jesus (Revelation 14:14). Now we must turn our attention to a question that has puzzled many sincere Seventh-day Adventists. ARE THOSE WHO HAVE DIED IN THE FAITH OF THE THIRD ANGEL’S MESSAGE SINCE 1844 PART OF THE 144,000? He wrote: “There must be some special reason for pronouncing this benediction upon them. Is it not because they escape the time of fearful peril which the saints are to encounter as they close their pilgrimage? And while they are thus blessed in common with all the righteous dead, they have an advantage over them in being, doubtless, that company spoken of in Daniel 12:2, who are raised to everlasting life at the standing up of Michael. Thus, escaping the perils through which the rest of the 144,000 pass, they rise, and share with them in their final triumph here, and occupy with them their preeminent place in the kingdom. In this way, we understand, their works do follow them: these works are held in remembrance, to be rewarded at the judgment; and the persons receive the same recompense that they would have had, had they lived and faithfully endured all the perils of the time of trouble.” –Daniel and the Revelation, pp. 677, 678 (emphases ours). At the bottom of these pages in the old edition of this book, as late as 1912 the editor placed a note clarifying the above statement: “Those who die after having become identified with the third angel’s message, are evidently numbered as a part of the 144,000; for this message is the same as the sealing message of Revelation 7, and by that message only 144,000 were sealed. But there are many who have had their entire religious experience under this message, but have fallen in death. They die in the Lord, and hence are counted as sealed; for they will be saved. But the message results in the sealing of only 144,000; therefore these must be included in that number. Being raised in the special resurrection (Daniel 12:2; Revelation 1:7) which occurs when the voice of God is uttered from the temple, at the beginning of the seventh and last plague (Revelation 16:17; Joel 3:16; Hebrews 12:26), they pass through the period of that plague, and hence may be said to come `out of great tribulation’ (Revelation 7:14), and being raised from the grave only to mortal life, they take their stand with believers who have not died, and with them receive immortality at the last trump (1 Corinthians 15:52), being then, with the others, changed in a moment, in the twinkling of an eye. Thus, though they have passed through the grave, it can be said of them at last, that they are ‘redeemed from among men’ (Revelation 14:4), that is, from among the living; for the coming of Christ finds them among the living, waiting for the change to immortality, like those who have not died, and as if they themselves had never died.” This note is omitted in later editions of Daniel and the Revelation. To clarify this point further, please study the diagram and explanation on the last page of this lesson. She stresses the fact that this is no symbolic figure but a literal number, an exact 144,000. Because of the growth of the Seventh-day Adventist denomination–especially right after the apostasy of World Wars I and II–now reaching the 2 million mark [in 1972], the concept of the 144,000 as a iteral number forming the total result of the third angel’s message is an anathema to Adventists today. Yet the old truth has not changed. The change in ideas took place as early as 1894, when some arose and proclaimed the so-called new light that the 144,000 should be only “living ones.” Consulting the graph in Lesson 15 showing the growth of the S.D.A. Church, you will see that this was in view of the rapid increase in membership which would soon reach the 144,000 mark. It was to combat this “new light” that Elder Loughborough wrote his booklet. Since that time of departure from the inspired testimonies, many theories have cropped up, until in our day Elder Robert Pierson, President of the General Conference, echoes the sentiment of his forerunner, Elder A.G. Daniells, saying: “If you want to read the inspired account of the triumph of the Advent Movement, turn with me to the words of the disciple out there on the Isle of Patmos, recorded in Revelation 7:9: ‘After this I beheld, and, lo, a great multitude, which no man could number, of all nations, and kindreds, and people, and tongues, stood before the throne, and before the Lamb, clothed with white robes, and palms in their hands. '” –Review and Herald, June 26, 1966. Elder Pierson thus believes that the great multitude which is spoken of in the Bible is the result of the Advent Movement. The Spirit of prophecy states very clearly that not the great multitude but only the 144,000 are the spiritual “product” of the third angel’s message. Testimonies for the Church, vol. 5, pp. 213, 214, 216, 136 (1881). Testimonies for the Church, vol. 3, p. 266. The Desire of Ages, p. 834.
death,” that the claim has been made that none will be among the 144,000 unles they live until the time of Christ’s second coming. This statement refers to the 144,000. Although this group is described as going through all the plagues, evidently this will be only partly true of those who have died in the faith of the third angel’s message, for they will be raised only at the end of the seven plagues. They are resurrected during the time of Jacob’s trouble, see the final outpouring of God’s judgments under the seventh plague, and are among those who are delivered from the death decree. Elder Loughborough concludes his argument with the following statement: “If there is still a doubt of the resurrected Sabbath keepers’ being numbered with the 144,000, consider the following from Sister White’s words in 1909. At the General Conference in 1909, Elder Irwin had a stenographer accompany him in a call upon Sister White. He wished to ask her some questions, and have an exact copy of the words of the replies. In conclusion, dear student, please study carefully and with earnest prayer the diagram at the end of this lesson. It presents very important concepts for these last days of mercy. 1. Give two outstanding reasons why the year 1844 is significant? 2. Can we be certain as to the beginning and ending dates of the 2,300-day (year) prophecy? 3. What text boosted the morale of the early Adventists after the great disappointment? 4. What is the outstanding feature of the third angel’s message? 5. What is the seal of God? How do you identify a seal? 6. When did the sealing time begin? 7. Who is the sealing agent? 8. What two phases do we recognize in the sealing work? 9. How many people will be sealed in total? 10. How many classes of saved people do we find in the Scriptures? 11. Which of these classes represents the total result of the third angel’s message? 12. To which class will those belong who have died in the faith of the third angel’s message? 13. When will they be resurrected? 14. How are the people mentioned in question 13 raised? 15. When will the great multitude be resurrected? 16. 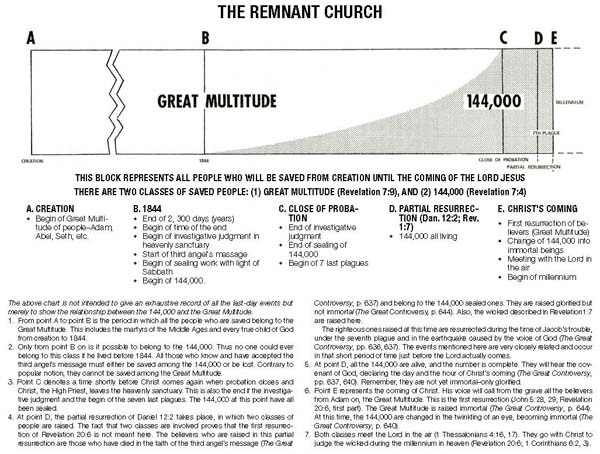 How is the great multitude raised? 17. Are we to take the 144,000 as a literal or figurative number? 18. What confusion exists among Seventh-day Adventists today concerning this issue? 19. How did Elder John Loughborough explain the phrase, “without seeing death”? 20. Will the 144,000 be alive when Jesus comes? 21. If you know, understand, and accept the present truth, could you be saved among the great multitude if you find the going too hard?